Novare Group Partners with City of Lawrenceville, George Berkow Inc. The City of Lawrenceville and George Berkow Inc., in joint venture with Novare Group, announce plans for a $200 million mixed-use, urban-style development across 32-acres of property in the City’s immediate Downtown district. The South Lawn project, slated to be the largest redevelopment project in Gwinnett, will infuse the already well known and frequented Historic Downtown with over 600 residential living units, more than 15,000 sq-ft of retail space, connect City Hall and the Police Station with the increasingly popular Lawrenceville Lawn and create a comprehensive walkable environment straight down to the Lawrenceville Square. Housing options will range from urban-style three- and four-story apartments and townhomes to single-family detached cluster houses and an age-targeted facility. The City is working jointly with George Berkow Inc. and Atlanta-based Novare Group to execute a vision for diversified housing options, complimentary amenities and connecting the Downtown with the walkable potential of a massive, yet community-centric, live work play environment. Novare Group, founded by Jim Borders in 1992, has developed over 12,600 high-end residential units and over $3B in real estate developments in Atlanta, Austin, Charlotte, Dallas, Denver, Houston, Nashville, Orlando, Raleigh, and Tampa. They are locally known for projects such as the adaptive reuse of the Historic Biltmore Hotel, TWELVE Hotel and Residences, Newnan Lofts, Metropolis Condominiums and SkyHouse Apartment Residences. This announcement comes on the heels of the City’s commitment to preserve and redevelop the original 12,000 sq-ft structure for the Hooper-Renwick School and work in tandem with Gwinnett County to install a Library around that location. Geographically, these new facilities will sit adjacent to the South Lawn development and compliment the larger mixed-use project making the combined redevelopment area a little over 37 acres in size. 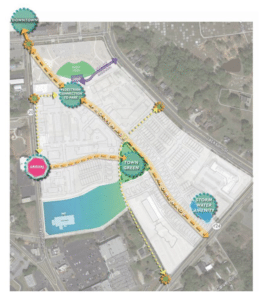 The South Lawn project was submitted to the Atlanta Regional Commission (ARC) for a regional impact study last week and a rezoning hearing is scheduled for Lawrenceville’s December council meeting. Lawrenceville’s public works’ facilities, currently housed on the site, will be moved into new space along Pike Street at the beginning of 2018 and a ground-breaking for the South Lawn is anticipated in the spring of 2018. For more information on the City of Lawrenceville and development activity, please visit www.lawrencevillega.org.